Today we’re leaving to drive up the coast & visit some friends in Maine – I am so excited to take in the sights while exploring a new area, enjoy some fresh lobster and make memories as a family. I chose this as my casual traveling outfit and I’m really loving the navy, pink & mint combination. Since it’s a 9-hour drive and comfort is key, flat sandals + light layers were a must. Clearly, something about going on this mini-vacation has me giddy because I couldn’t stop laughing during this shoot! What a fun color combo! Enjoy your road trip. i love all of these smiling pics! have a GREAT time!!! Great color combo! I'm SO jealous you're going to Maine, its one of my favorite places. And LOBSTER…drooling! i need a blouse like that in every color!! Have fun! These colors look gorgeous together! When I'm going on a long car trip, I have to wear something looser around the waist, otherwise I will have to stop and pee 12 times. TMI? Sorry but it's true! And it's definitely something I take into consideration if I'm driving more than say 2 hours. I LOVE your outfit here, but I couldn't wear those jeans to sit down for so long! You look so cute. I always wear workout attire for car trips and look a hot mess! Love that bag! check you out with the big smiles; LOVE!! And, adore this color combo. Have the best trip. I'm loving this outfit! The mint skinnies are so cute! Have fun in Maine! such a fun outfit – looks perfect for a long drive too, comfort is key when you stuck in the car that long! comfy and polished looking just as travel should be! Love the scarf, it looks exactly like a much more expensive A peace treaty one. Good find! I have this scarf and love it! Fantastic travel outfit so you can be comfortable yet stylish at the same time! Have a great trip! 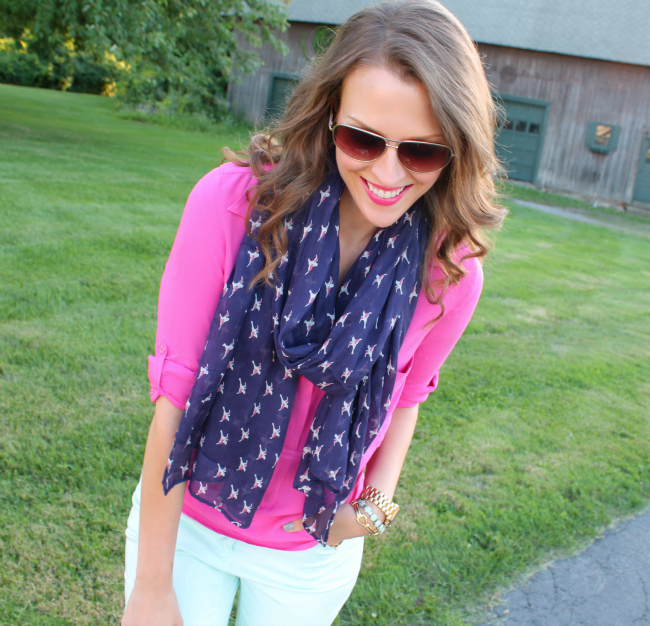 Cute scarf and blouse! 🙂 Have a good trip! That's a lovely colour combination, so fresh. I love the colour of your lipstick – I just bought one in a similar shade today. Enjoy your trip! Beautiful outfit, loving that the mint skinnies! You look so happy here, it's lovely! Great colors together. Your eyes look so pretty in the last photo especially. Enjoy your trip! This outfit is adorable, and perfect for traveling! Have a wonderful time!! I never know what to wear when traveling. I think you look perfect! Have fun on your mini vacay! I love the color combo! I love this color combo and I really love that scarf. I might have to head over to Old Navy this weekend. Love the color of your blouse. You look so cute! I always have the hardest time looking good while traveling, I always end up looking quite bedraggled, haha! That scarf is so pretty. Kimberly You look gorgeous! Love your outfit too–great mix of colors, textures and patterns. I LOVE your styling at look!!! Its very fashionable and stylish!!! Happy mini break! Absolutely loving the colours in this outfit. I sometimes stubble with what to wear on long haul flights, I flew back to England on Thursday night – but layering is key I think. I do like the straps on your sandals here too, and the studs on the bag straps really stand out. Love the combination of all these colors! Seriously you are so gorgeous! I love this color combo, the mint is unexpected but so great with the pink and navy. Hope y'all had a great time! I love this color combo too! And that lipstick is perfect on you. So pretty! 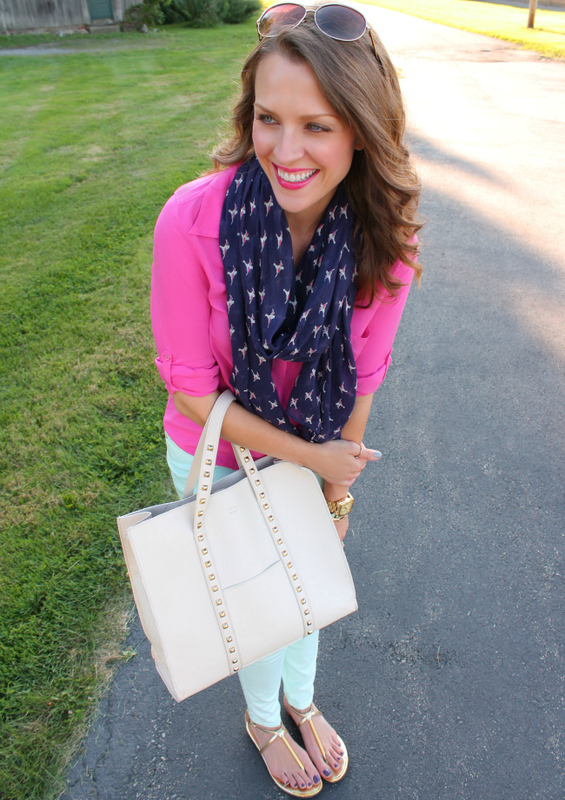 Love the pops of color and the practical yet totally cute basics! Hope you have a fabulous trip! so cute again! I love your style – classic with a twist!